I just got back from an advanced screening of Hot Fuzz – the new cop buddy comedy from the same trio behind Shaun of the Dead and three-quarters of Spaced. Simon Pegg plays Nicholas Angel – one of the Metropolitan Police’s finest. The problem is he’s so good he’s making the rest of the force service look bad in comparison so he is quickly dispatched to the idyllic village of Sandford out in the countryside. Angel soon meets the local constabulary who are used to dealing with the odd escaped goose or accident and have their own interpretation of alcohol and gun laws. Long-time friend and former flatmate Nick Frost stars as local officer Danny Butterman who images city policing to be much like Point Break and Bad Boys II. Director Edgar Wright produces plenty of slick visuals much in the style of those found in Shaun of the Dead and Spaced albeit more action based yet finds time to slip in plenty of grisly deaths as the plot unfolds and the body count starts to rise as a bizarre series of ‘accidents’ befouls residents of this sleepy hamlet. There are plenty of laughs including physical slapstick, in-jokes and movie references though it has lost some of the magical charm Shaun of Spaced possess. Despite the setting being firmly English west-country it feels like the script was written with more of an international/American mainstream audience in mind with both the plot and the genre nods being spelled out so much as characters holding DVD’s of the film to the camera and reading the tag-lines. Overall highly enjoyable and probably the best film I’ve seen so far this year – although it is only February. Alas given the likely success this and the prior success of Shaun there is almost zero chance of that elusive third series of Spaced. For some time now I’ve been on the lookout to replace my aging Sony Ericsson P900 with something just as powerful but better equipped. With a keyboard high on my wish-list too the choice kept coming down to Danger’s Sidekick II, the Blackberry or the iMate K-Jam. Reviews of the K-Jam suggested it was a little slow and the Sidekick II has been an age in coming. The Blackberry is a closed platform and looks like a cheap 90’s PDA. Imagine my surprise when I found out that that the people who manufacture the K-Jam, or Qtek9100 as they prefer to call it, were shipping a replacement called the HTC TyTN – pronounced Titan apparently. Luckily for me the official UK retainer Expansys had a handful of the new wonder-phone in stock a couple of weeks before the official August 30 launch date and so I nabbed one as quickly as I could. It seems you can’t review a product these days without describing the packaging and box. I’m pretty sure Apple are to blame for this. The box is a smartly designed black affair that seems to indicate HTC are prepared to spend the money to get their own brand up on shelves and being successful. I don’t think this means they’re abandoning their ORM role and I’m sure you’ll see Orange/iMate branded versions soon enough. Inside the box are the phone, a spare stylus, a leather carry case with belt-clip and strong magnets to keep it closed. These magnets are so strong I’ve found my car keys getting stuck to them unexpectedly once or twice. You don’t want to be putting your credit cards in a pocket near it. 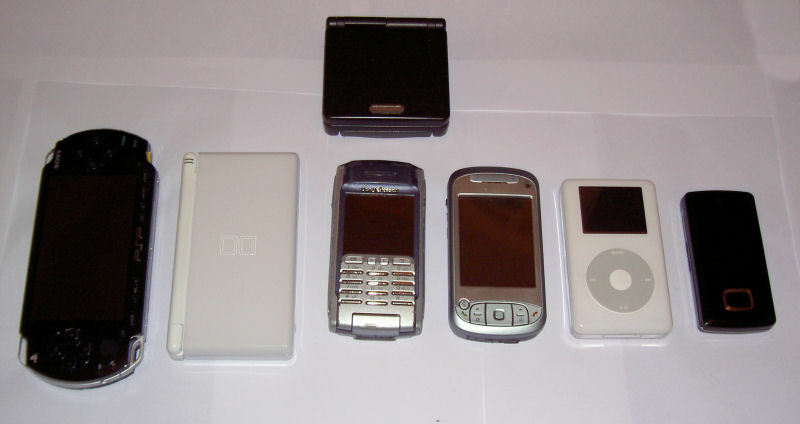 Shown (from left to right): Sony PSP, Nintendo DS Lite, Gameboy Advance SP (above) / Sony P900 (below), HTC TyTN, iPod Photo, LG Chocolate. This is in additional to the usual phone type applications and management software including an awful calculator application that has a terrible UI and only the most basic of features. A shortcoming of this is that the upcoming appointment often displays just the day of the week “Monday, Tuesday” etc. whilst the current date is shown simply as “26 August 2006”. If, like me, you often forget which day of the week it is then this screen can send you into shock wondering if the shown appointment is this week or next. Adding either the day of the month to the appointment or current day of the week to this screen would help. Handwriting recognition was pretty good, certainly up from the P900 and when using the actual keyboard a T9 style prompting system means even slow typists can throw together proper messages without having to resort to text-speak. Many reviews seem to completely overlook the fact that they are reviewing a phone and that making calls is a big part of that. Calls were to be as expected however the primary interface for placing them was an unexpected and pleasant surprise. Presented with a touch-screen numeric pad as you start to type the number a list of people who match the name (using the ABC on 1 etc – a bit like T9) pops up. Pictures from the camera are sharp and well defined under good outdoor conditions. Once inside things deteriorate as is the usual case with mobile despite the on-board light/flash. The messaging applications picked up my POP3/SSL mail just fine and quite happily sent replies via SMTP/SSL with authentication. The SMS/MMS shares the same application and interface so once you’re through the tricky setup process things are rather easy going. I must confess that all my contacts, music and appointments all live in Mac OS X so I was very upset to find that iSync doesn’t support Windows Mobile devices. The aptly named The Missing Sync came to the rescue and let me sync up my contacts via the USB port although there seemed to be some issues syncing via Bluetooth that I think are more TyTN related than a fault of OS X or The Missing Sync. The device supports connectivity and charging through it’s own mini-USB connector which worked just flawlessly under OS X.
Bluetooth is also supported and here things didn’t work too well. When trying to pair under Windows the OS would quickly give up waiting for the phone before you’d had chance to type the second number. Pairing under OS X was more successful but the information provided suggested it doesn’t support the Obex file transfer system which made it rather tricky to send files to the device. Wireless connectivity over 802.11b/g showed quite good reception, reaching not quite as far as my MacBook Pro but only a few meters off being able to get a usable connection. It can take a few moments longer to get the connection established than the status shows so give it a second before hitting send/receive. If you like to have your email, web, Skype and a few useful tools with you at all times and lugging a laptop round all day isn’t an option (when is it?) then this could be the phone for you. 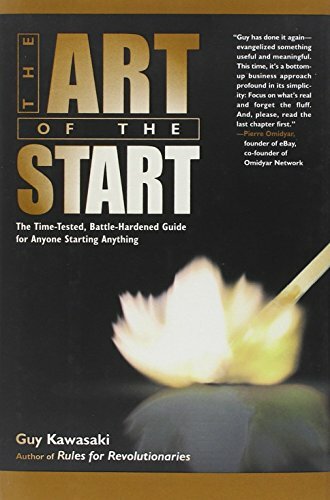 Based on the Windows Mobile OS you can be sure of a wealth of third party applications for it or failing that write your own using Visual Studio 2005. It’s got the features and potential the Blackberry and P9xx series can only dream of.